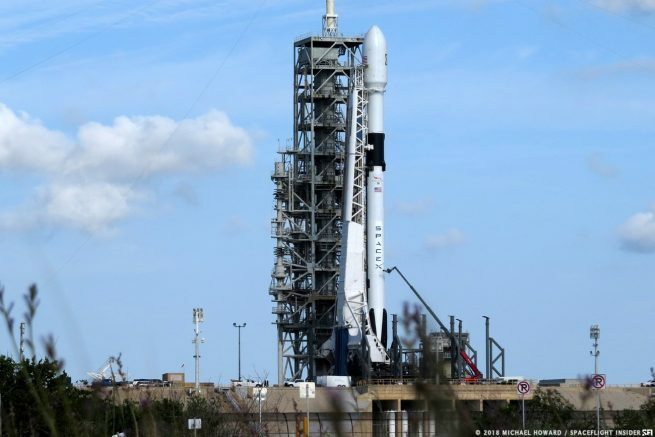 CAPE CANAVERAL, Fla. — Working to maintain an average flight tempo of once every two weeks or so, SpaceX is preparing to send another of its Falcon 9 rockets aloft from Cape Canaveral Air Force Station’s Space Launch Complex 40. 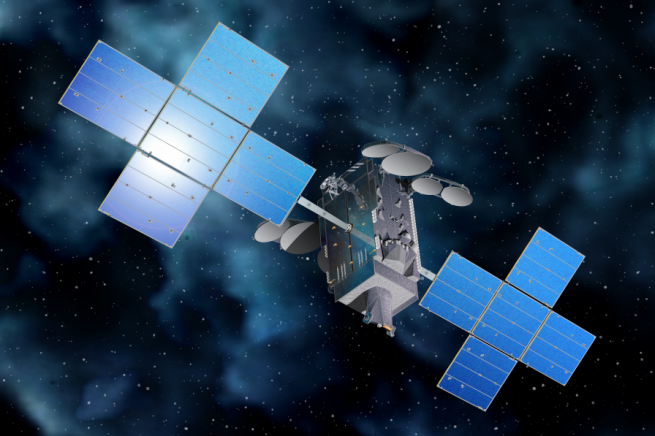 The upcoming Telstar 19 VANTAGE flight marks a critical milestone in terms of the company’s 2018 flight manifest. The NewSpace company has eyed a rapid launch rate. With the June 29, 2018, flight of the CRS-15 Dragon on its way to the International Space Station, the period in between flights will be a scant 13 days. That is if the Hawthorne, California-based SpaceX can launch the Telstar 19V communications satellite atop a 229-foot (70-meter) tall Falcon 9 on its way during the four-hour window that opens at 1:50 a.m. EDT (05:50 GMT) July 22. Additionally, if the schedule holds, the company is aiming to launch the Iridium-7 mission three days later on the West Coast, and the Merah Putih satellite on SLC-40 on Aug. 2. Each of these missions will utilize the company’s new Block 5 variant of the Falcon 9. The B1047 first stage is slated to be used for the Telstar 19 VANTAGE flight. After the Falcon 9’s second stage places the SSL-built Telstar 19 VANTAGE into a geostationary transfer orbit, the satellite will use onboard propulsion to circularize its orbit and position itself some 22,300 miles (35,900 kilometers) over the Americas at 63 degrees west. Operated by Telesat, the satellite is expected to provide Ku- and Ka-band coverage between northern Canada and South America. Additionally, it is designed to provide coverage over the North Atlantic Ocean for aircraft and ocean-going vessels. Based on SSL’s 1300 platform, the spacecraft is designed to operate for about 15 years. It’s two solar panels are expected to provide some 15 kilowatts of power. Once in orbit, according to Gunter’s Space Page, it will be co-located with Telesat’s Telstar 14R. The weather for the Sunday morning liftoff is currently expected to have a 40 percent chance of launch-violating conditions. The primary concerns are thick and cumulus clouds, according to the 45th Weather Squadron based at Patrick Air Force Base in Florida. The squadron expects isolated afternoon rain showers on Saturday to linger later into the night than typical because of a weak frontal boundary. Should a 24-hour delay occur, conditions are expected to be similar. SpaceX completed the static fire test of the rocket on July 18. For the evaluation, the rocket lacked both its payload fairing or the precious cargo that would be contained within. There was a time that the company performed the routine test with the payload fully installed to save time. 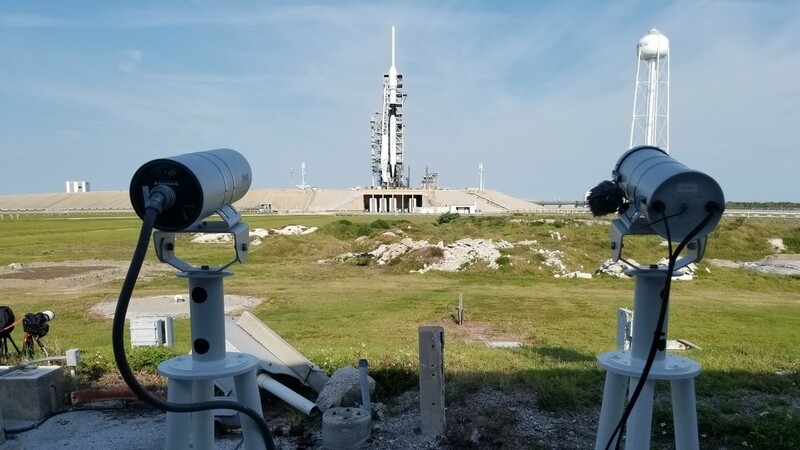 However, on Sept. 1, 2016, during the static test fire for the Amos-6 mission set for a couple days later, the rocket unexpectedly exploded, resulting in the loss of both the Falcon 9 and its $185-million satellite payload. After a vigorous four-month investigation, SpaceX traced the explosion to one of the three composite overwrapped pressure vessels (COPVs) inside the second stage’s liquid oxygen tank. In particular, it was concluded the failure was the result of an accumulation of liquid oxygen between the COPV liner and overwrap in either a void or a buckle ultimately lading to an ignition and failure of the COPV, according to the company in January 2017. Despite this setback, SpaceX forged forward with its Falcon family of rockets. The company changed its fuel loading procedure to eliminate the potential for this scenario happening. Additionally, the COPVs were redesigned for the latest Block 5 variant. Block 5, the final major change for the Falcon 9, is designed to be able to conduct flights with as little as two days separating each mission (with an inspection of the rocket required between each flight). SpaceX has stated that its booster can be inexpensively and quickly reused and that it be capable of carrying out as many as 10 flights without significant refurbishment. Other design changes include increased engine, more thermal protection around the nine Merlin 1D engines at the base of the Falcon 9 and a thermal protection coating to help it during reentry and recovery maneuvers. The company has stated more than 100 changes were made for the Block 5 design with the most visible being a black protective coating on the interstage, the raceway—a protective path that carries cabling and piping down the side of the vehicle—and landing legs. The first Block 5 was launched May 11, 2018, with the Bangabandhu-1 satellite. The first stage was recovered on a drone ship less than 10 minutes later. The three flights since then have used previously-flown Block 4 first stages with recoveries not attempted. SpaceX has since been evaluating the performance of the Block 5 first stage. If all goes as scheduled, this flight will be SpaceX’s 13th of 2018 (including the maiden launch of the Falcon Heavy in January) and the 12th Falcon 9 mission of the year. Overall, it is expected to be the company’s 57th Falcon 9 flight since its debut in 2010. Correction: A previous version of this article said the satellite’s panels generate 15 kilowatt-hours of electricity. It should have been 15 kilowatts of power. That’s 15 kilowatts (power), NOT 15 kilowatt hours (energy). That power is provided to the entire spacecraft, not just the antennas. The majority does go tot he transmitters but only a fraction makes it to the antennas. We strongly believe that SpaceX is the most advance launching system.